It is located right along Dudy Noble field where I spent so many good times, and they are relived each time I go to the walking trail. I was shocked and dismayed when MSU announced Dudy Noble Field would be dismantled to make way for a new and better baseball stadium. I just didn’t realize it would be this week. With it went a constant reminder of my fella Jack, and good friend Joanne who shared Skybox No. 1. They are no longer with us. i hung on the fence designed to keep the likes of me off the premises. With tears in my eyes,I watched as the skybox where I spent so many weekends, fall into a mangled puddle of metal . It looked like someone had blown it up with a IUD (no wait that’s a birth control device – make that IED? I tried to find the remains of the beloved “left field lounge” where we watched games when it wasn’t too hot or cold or just wanted to cut up. 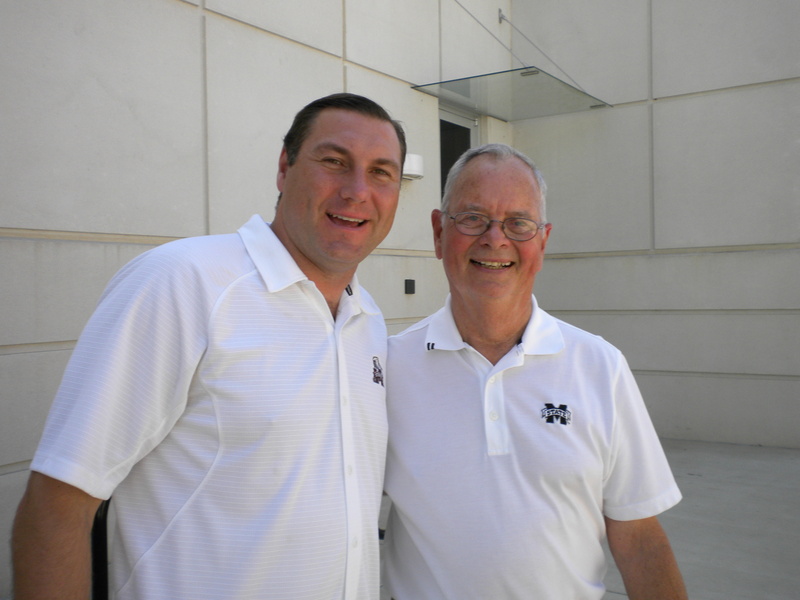 I was first introduced to college baseball 18 years ago by Jack (pIctured above with football’s Coach Mullen who visited the box). Jack played short stop for the Dawgs in the 60s and was an avid fan. I didn’t know a thing about the game and really didn’t care. On our first date, he took me to a game. Bored to tears, I kept asking when the halftime was. Lordy by the 7th Inning stretch I had learned about “ducks on the pond” and RBIs. I was hooked. Dudy Noble was one of the finest baseball venues of its time and certainly the best in the Southeastern Conference. I can’t imagine what will take its place but it must be “mighty fine” to top old Dudy. So long old friends, but my long term memory is still in tact and I’ll carry fond memories forever. Tomorrow I’m going to bribe the demolition crew to bring me a few remnants of the skybox. Heaven knows what I’ll do with them – maybe make a necklace and some earrings? 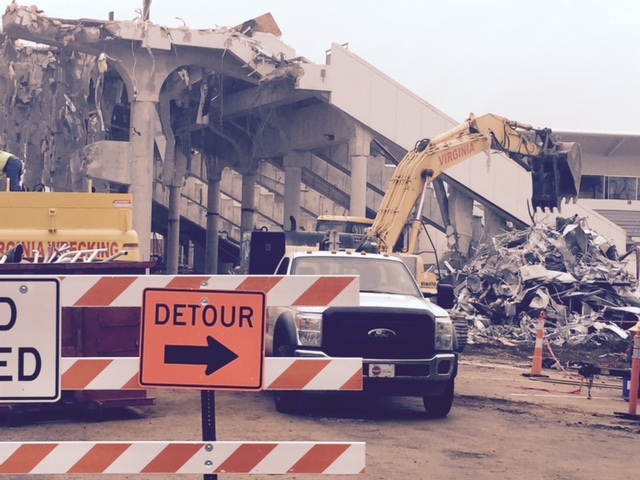 This entry was posted in Boomerang & the old gang and tagged Falling in love with Baseball, MIssissippi State Demolishes Dudy Noble Baseball Field, One of Baseball's finest fields is gone, So long Dudy Noble by Emily Jones. Bookmark the permalink. I’m in agreement with you about Dudy Noble! I don’t think I’ve been to the stadium since the last revision so i’m really “old school”! And at that rate, I’ll probably not visit the new spiffed up version, either–unless I’m lucky enough to move back to S’ville before I’m too worn out to watch Dawg baseball! What was your friend Jack’s last name? I was a dedicated fan during the late 60s and again in the early 80s. I’ve been searching my (failing) memory bank but can’t come up with a shortstop named Jack. His name was Jack Vaughan – now that I think about it he may have played second base. I learned a lot about baseball but field positions weren’t my forte! If you haven’t been on campus in a while, you won’t recognized the place. New buildings are going up everywhere. I can remember the days when Highway 82 went right through the middle of campus. That would never work today. You are right – what can replace Dudy Noble field? Why not keep the old sky boxes and just add new ones? What a waste.